With the new movie Wonder Park out, the movie themed toys are quite popular. I was lucky enough to receive some of them to review. First is the Wonder Chimp Scented Plush Assortment. They come in 4 styles: Bunny, Princess, Flower and Bee. I received Bunny. These chimps are large, soft and cuddly. They are perfect for hugging. And just like in the movie Wonder Park, they smell like cotton candy. 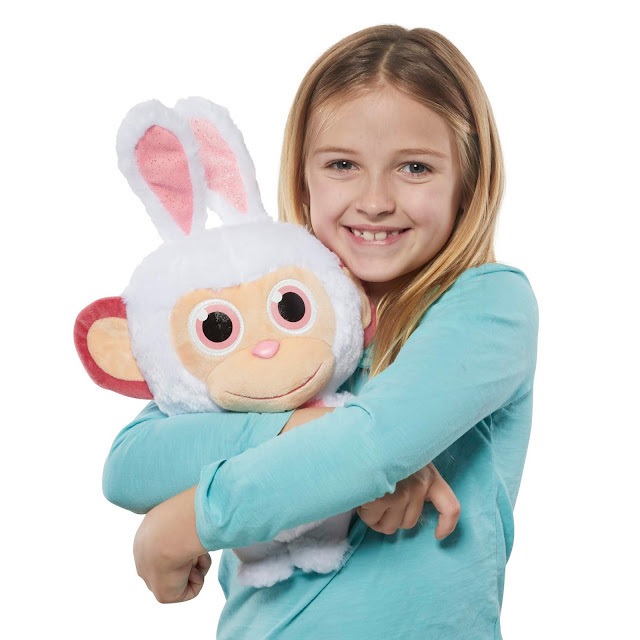 My daughter loves cotton candy and she loves that the bunny chimp smells just like it. It is great to snuggle with while falling asleep at night. They are made by Funrise and are recommended for age 3 and up. The suggested retail price is $14.99. Next we have the Sunny Bunny Blabbers Plush Assortment. There are five different talkative characters available: Hopper, Turbo, Big Boo, Iris and Shiny. I received Hopper and Big Boo. Press their bellies and they make cute and silly sounds. My kids love the sounds they make. They love their big bright eyes as well. These are also made by Funrise and are recommended for age 3 and up. The suggested retail price is $9.99. 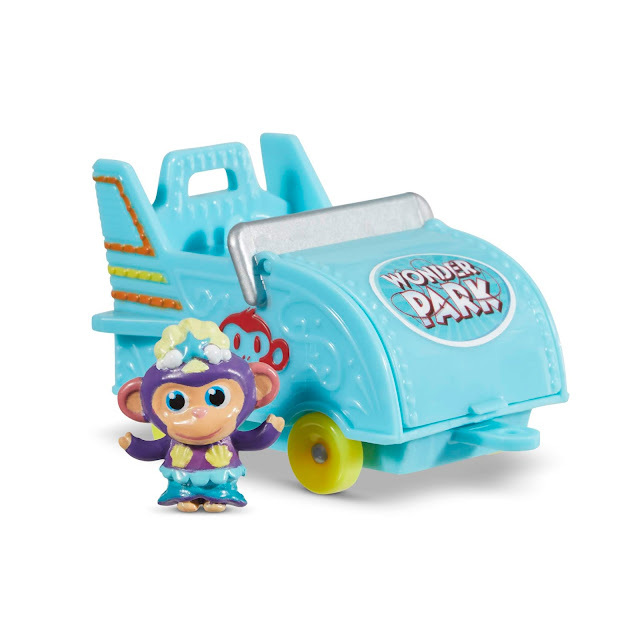 Next we have the Wonder Park Wonder Chimp Surprise Assortment. These are the official souvenir of Wonderland. There are 30 different Wonder Chimps in the assortment. Each one comes hidden in a blind bag and you won't know which one you are getting until you open it. Each one comes with its very own free-rolling roller coaster car. You can put the wonder chimp in the car and send it for a ride. These come in Series 1, Series 2 and Series 3. There are different chimps in each series as well as a different color for the roller coaster car in each series. You can connect the cars together to make your own line of coaster cars. 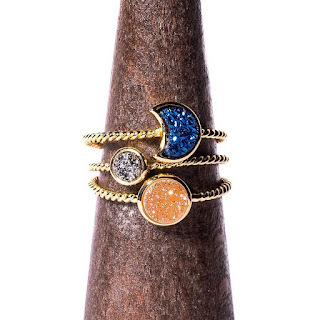 These are made by Funrise and are recommended for age 3 and up. The suggested retail price is $2.99. This is the Gazillion Bubble Turbo Bubbles. 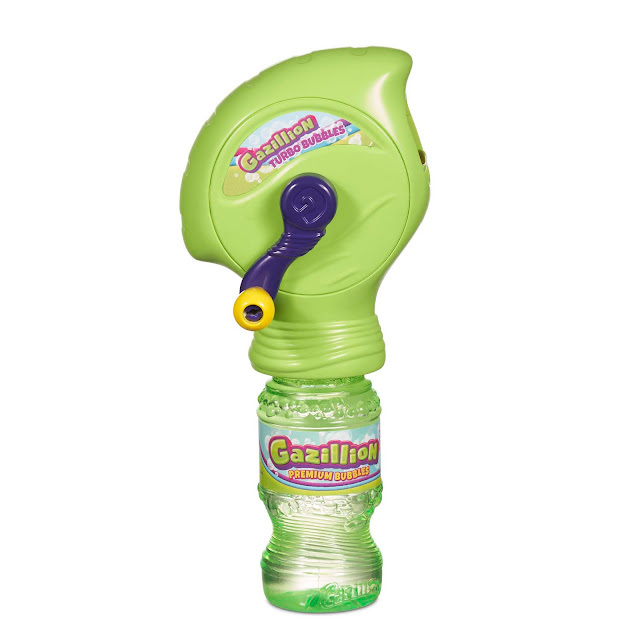 This is a hand powered bubble blaster that you can carry with you when you're on the go. This is perfect for all ages (it is recommended for age 3 and up). You just screw it on to the included bottle of bubble solution and crank the handle to make tons of bubbles. No batteries are required, all of the power is supplied by you. The Turbo Bubbles comes with a 4 ounce bottle of the top secret Gazillion Premium Bubble Solution. It is made by Funrise and the suggested retail price is $4.99. This is Smash Crashers. It's a vehicle with a collectible twist. Smash the truck and unbox the stuff. There are 12 different trucks and each features a unique design that reflects their personality. When the truck crashes, two crates pop out. There are surprise collectibles hidden inside. There are 50 different figures to collect in Series 1. All of them are based on themes to gross you out, like Bathroom Brigade and Grossout Garage. This includes the rare Barfing Bedroom figures and the special edition Edgy Electronics. Each truck includes 2 hidden collectibles and one bonus collectible, making it a total of 3 collectibles in every package. They are made by Just Play and are recommended for age 5 and up. The suggested retail price is $6.99. These are the Hairdorables Pets Series 1. Aren't they just adorable? These are the newest members of the Hairdorables #SQUAD. These loyal and lovable pets express their unique personalities with their "Big Hair Don't Care" attitudes. Pull, peel and reveal 8 surprises inside. Each pet comes with its own brush to style their hair with. They also come with accessories and stickers. 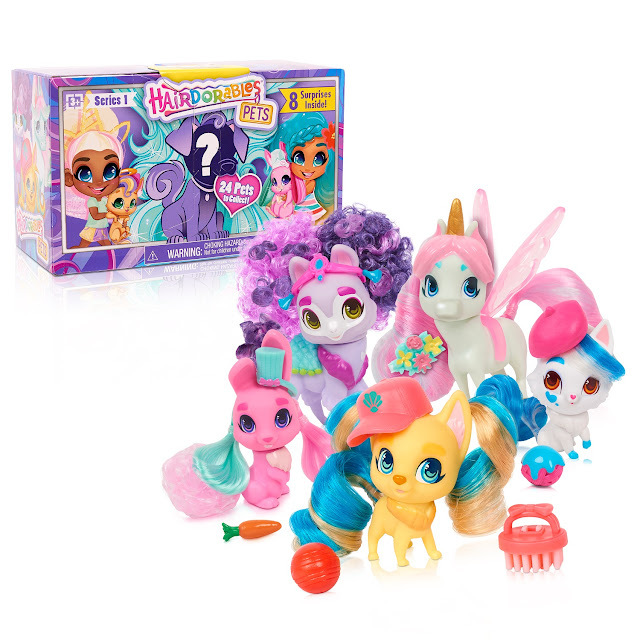 There are 24 of these adorable cuties in Series 1, including one Ultra Rare! They are made by Just Play and are recommended for age 3 and up. The suggested retail price is $7.99. And finally we have these trendy Cutetitos. 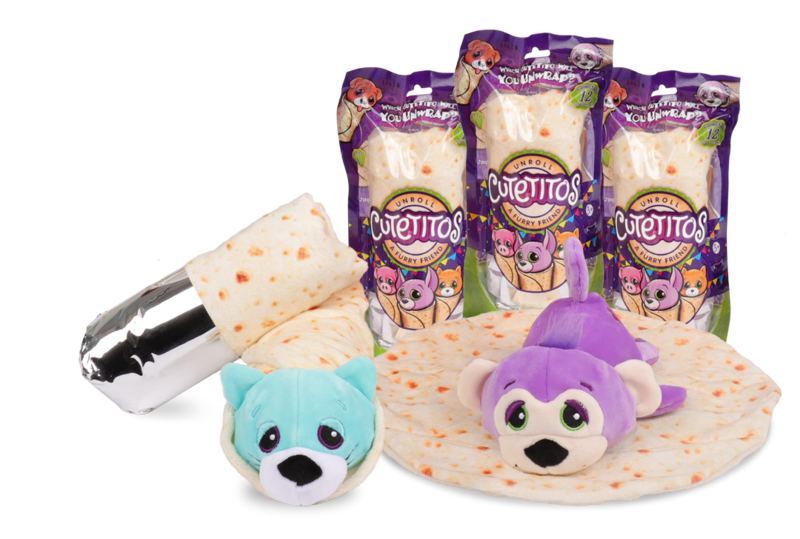 Unroll the burrito blanket and discover an adorable, collectible stuffed animal hidden inside. There are 12 different Cutetitos, including some super rare ones, with names like Slothito, Puppito, Bunnito and Monkito. Which one will you find wrapped up and hiding inside your uniquely wrapped burrito blanket contained inside your large blind bag? Once you have unwrapped it, discover your Cutetitos' personality "Hot Spot" (mild, medium, hot or super spicy). Also discover their birthday and and favorite "quotito". These are made by Basic Fun! and are recommended for age 3 and up. The suggested retail price is $9.99.